Battleborn came out a few weeks back, on May 3, sandwiched between the launch of Overwatch’s open beta, last week’s Doom, a bit of Stellaris and massive releases on other platforms too. Despite all that, Take-Two said in their earnings call last night that they are happy with its performance so far. Could it grow to be one of the best FPS games ever? Borderlands, of course, is one of Take-Two and Gearbox Software’s darlings, a humongous franchise that’s been very successful over the years. Others involved with the project have said that the figures for Battleborn are slightly ahead of those for Borderlands at a similar time, presumably signifying the general growth of the gaming market. “We’re encouraged, and we feel good about it, [but] it remains to be seen how it performs,” concluded Zelnick. It’s good to hear it doing well as, at least for me, it rather disappeared in the utter scrum of amazing games that May has been so far, especially shooters. Those of you who did leap in – I’ve seen from comments on other articles that we have a few of you among us – how are you finding it? 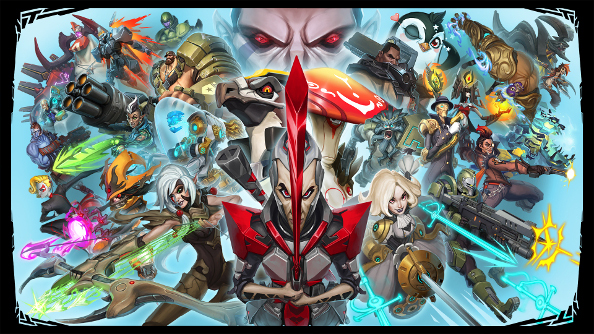 Where does it fall on the MOBA line, and do you think it could grow to be the next, or another, Borderlands?